In short, full-mouth rehabilitation (or sometimes called reconstruction or rejuvenation) is the individual recreation of each tooth in a mouth. Full-mouth reconstruction is needed when the teeth are worn down, broken or missing, causing problems in both the bite and appearance of the mouth. The Medical Center Dental Group can totally rejuvenate your mouth, creating a healthy, beautiful smile in as few as two visits. This process is so successful that others cannot distinguish the real teeth from the restored teeth. Technology : - Many doctors utilize the Tens, a low level electrical impulse machine that exercises the jaw muscles and releases the lactic acid buildup from muscle overuse in the wrong position. 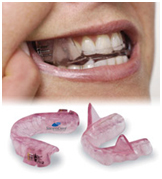 Then the Myotronics K7, or a similar bite measurement technology, measures the jaw's muscle function in both stressed and relaxed positions. A sonograph may also be used to listen to your jaw joints. X-rays, called tomographs, measure and reveal the jaw-to-skull ratio and aid in diagnosis. To complete this process with the best possible result for your bite, it is best to work with a doctor who can prepare your entire mouth in one appointment. Some highly qualified doctors prefer to work on one arch at a time - uppers, then lowers. If your dentist prefers to work on one tooth at a time, or in quadrants (1/4 of the mouth), it will be extremely difficult to restore your bite to a comfortable position. Complications : - Once a patient commits to the use of an orthotic, the results are not easy to reverse. After just a few weeks of constant wear, the bite will shift and the muscles will begin the get used to the new, more comfortable position. If the wearer decides not to complete treatment and follow through with the full mouth restoration, and they remove the orthotic, they will experience discomfort as the muscles move back to their previous position. All of the TMJ symptoms they experienced before the orthotic was placed will return.